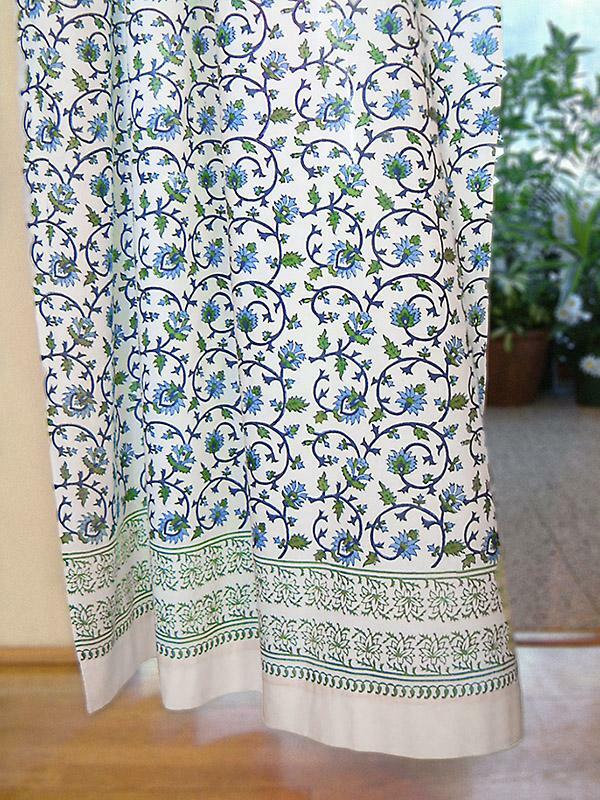 Refreshing and serene blue, white, and green florals cover this exotic fabric inspired by Taj Mahal gardens! 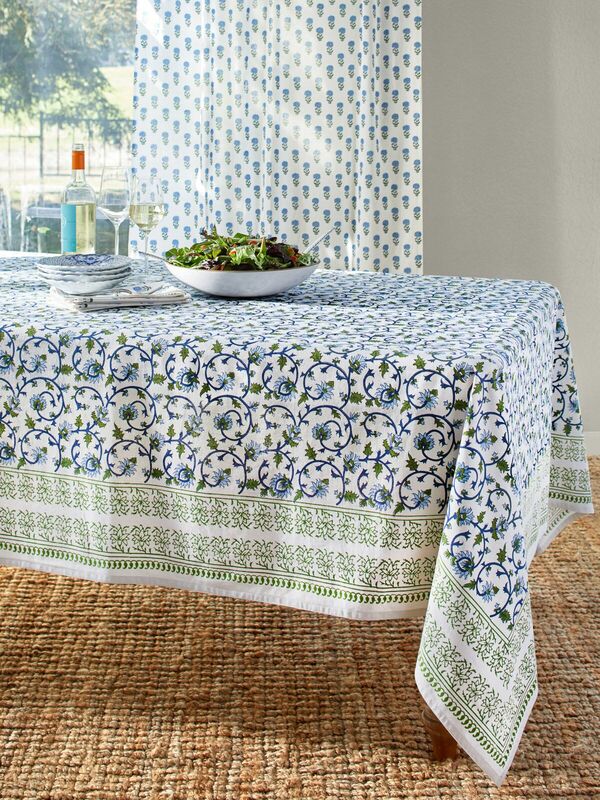 Find prints you’ll love for the kitchen, living room, dining room, and bedroom. Most of us spend a good amount of time in the kitchen – the heart of the home. Why not add a bit of color and style to the scene? 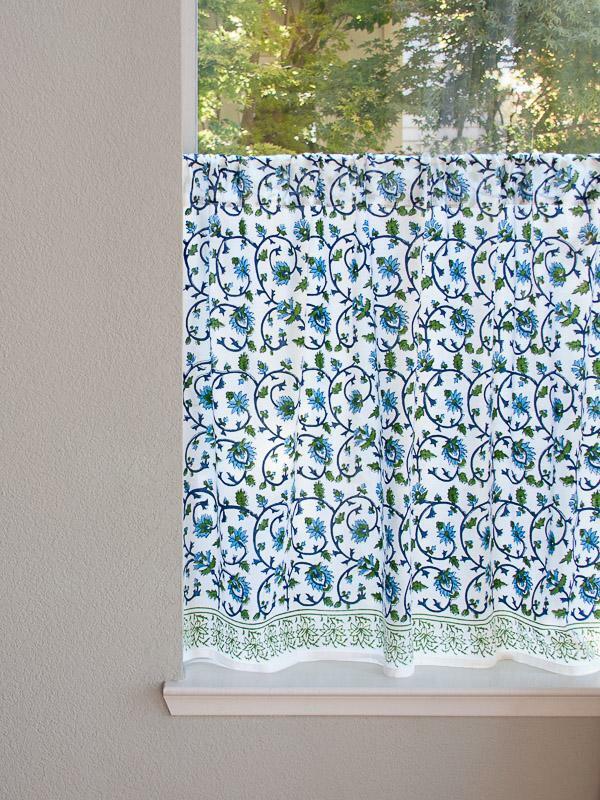 Our light-diffusing, hand-printed blue and white curtains brighten up the window, adding color and privacy, while still allowing in lots of gorgeous natural light. 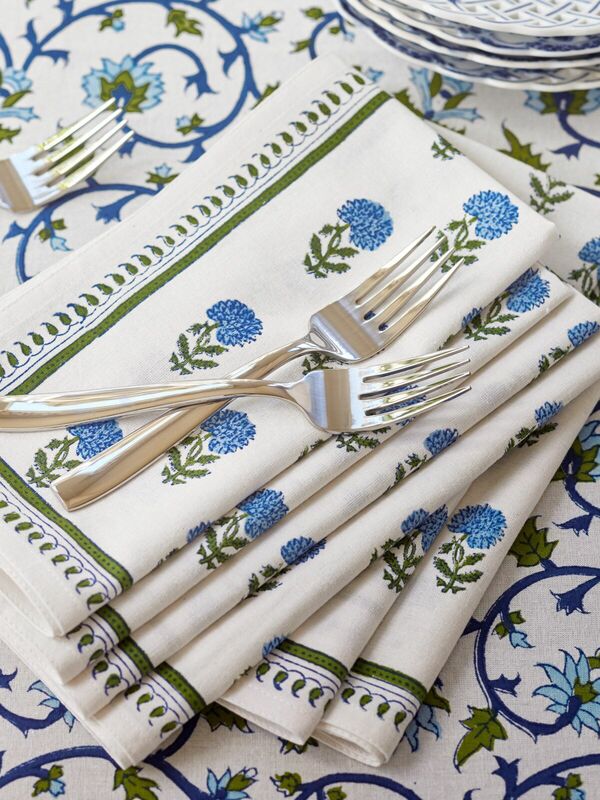 The color scheme of these sweet cotton napkins is at home at your table year round. 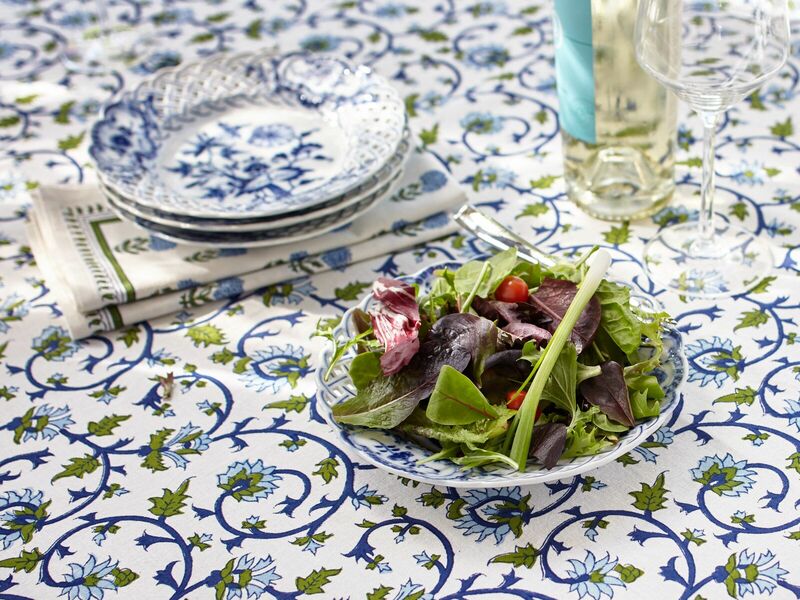 Use with white plates and accents in spring and summer, and with deep russet or terra cotta accessories in fall. 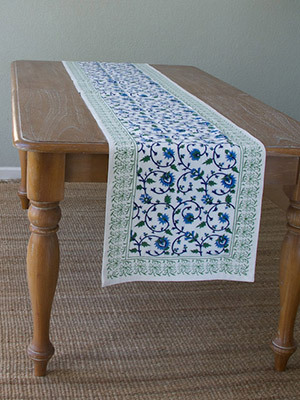 We love the soft, natural look of this table runner either over top a simple cotton tablecloth, or atop the gorgeous lines of a wood table. 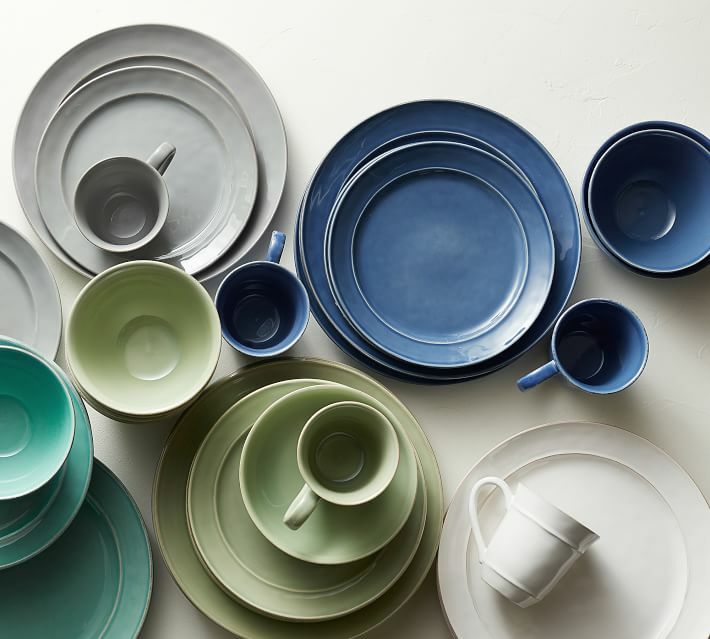 Either way, it brings understated design and color to your kitchen! There’s always a room in the house which is both a refreshing retreat and a welcoming hub. 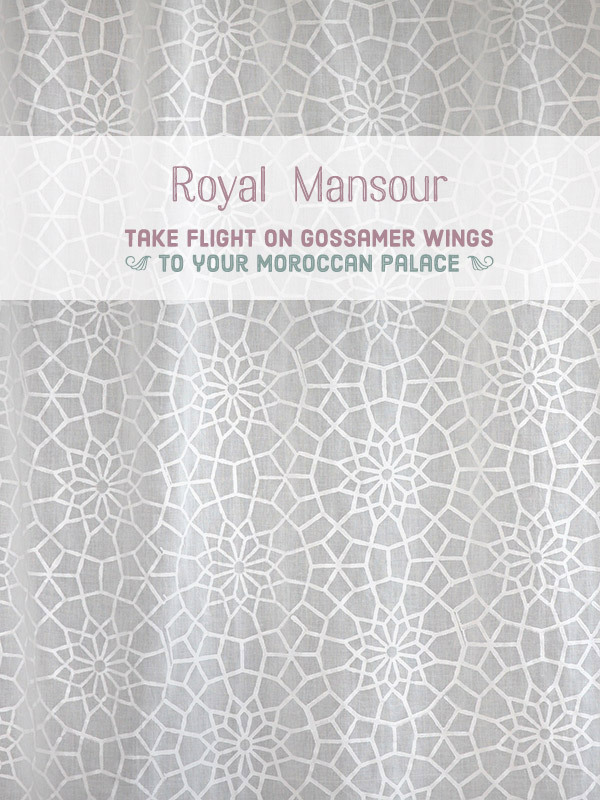 We imagine the Moonlit Taj living room as just such a space. 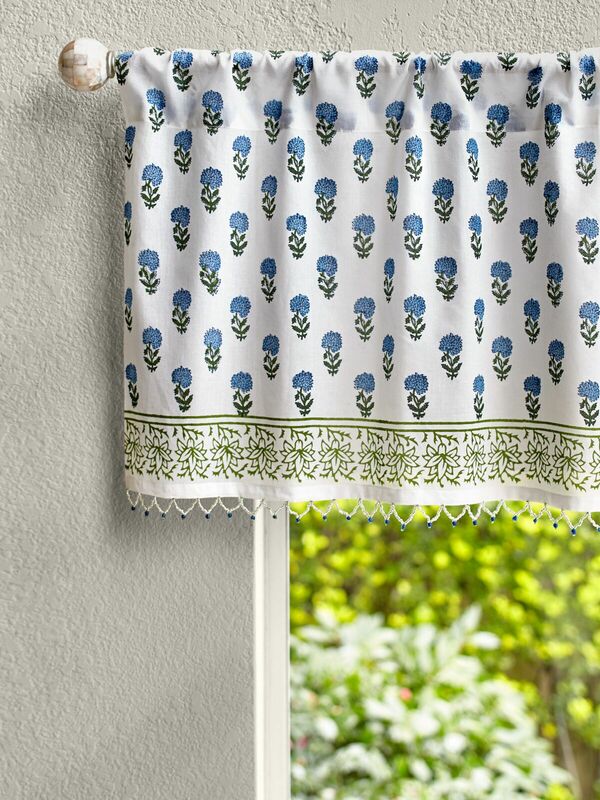 Start with our 100% cotton, sheer curtains, covered, in scrolling blue and turquoise flowers. 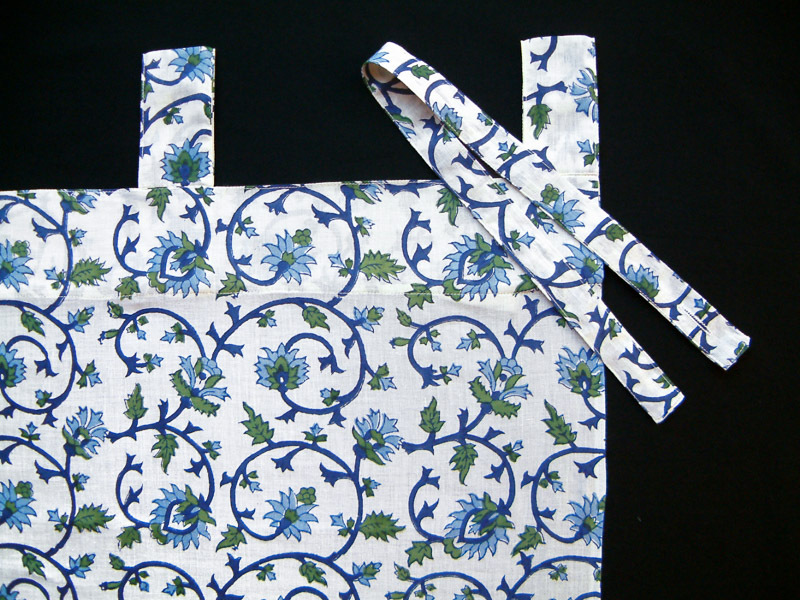 These create a sense of ease and lively global style. Add carved wood accessories, fresh flowers, plump, contrasting throw pillows, and a simple mirror to catch all the gorgeous light and color! We love Casablanca soooo much! 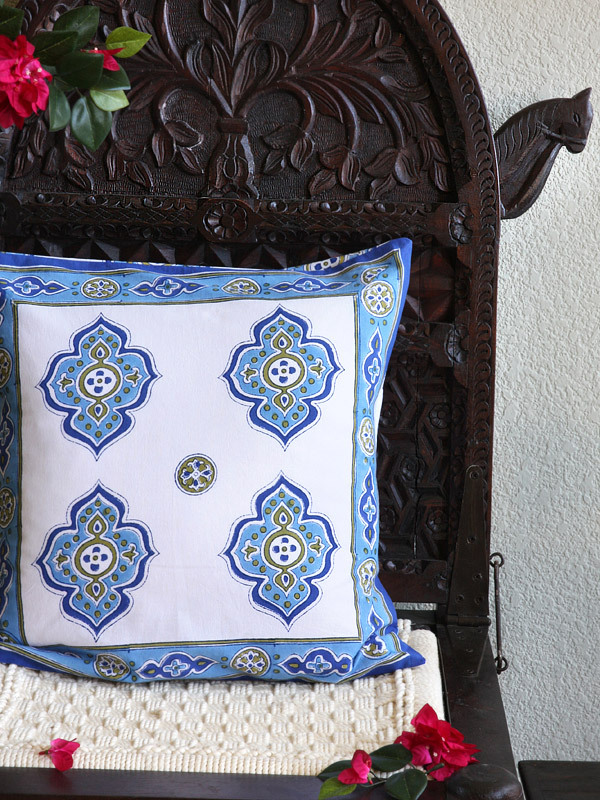 It’s a gorgeous combination of seaside colors and Moroccan architectural style. 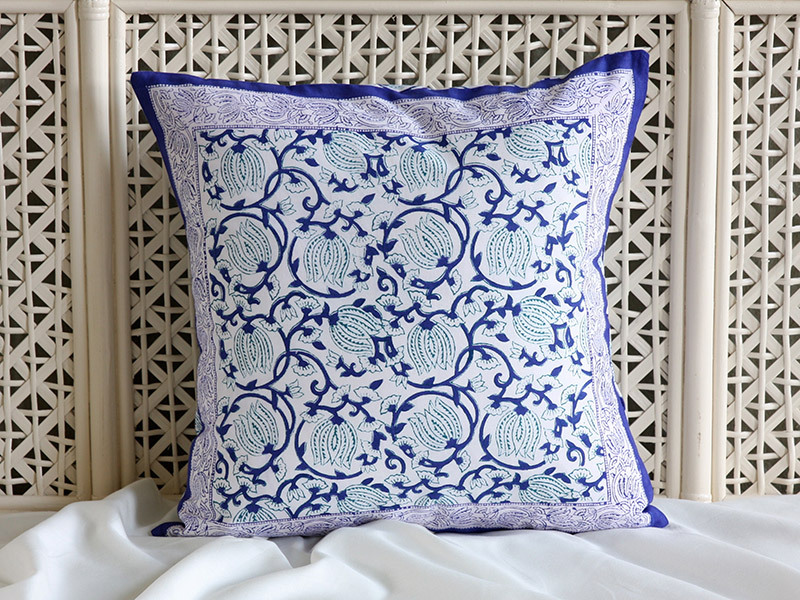 This throw pillow will bring interesting graphic contrast to our scrolling, floral curtains. 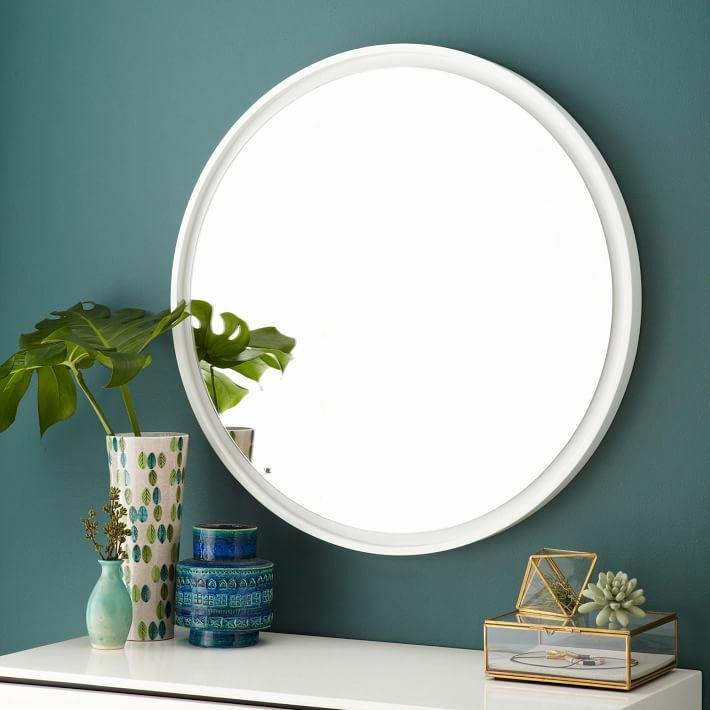 We chose this mirror because its simple, elegant shape adds light and clean lines to our refreshing blue and white space. 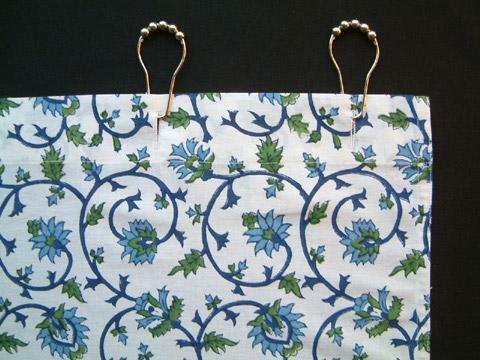 Hang above a side table (as pictured) or use as an anchor piece in a wall art grouping. 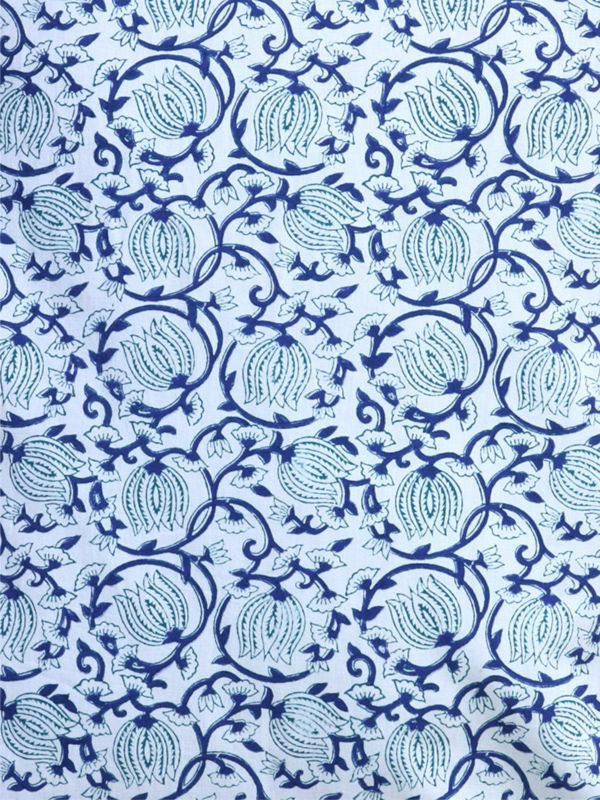 This print is the reverse of another favorite blue and white: Midnight Lotus. 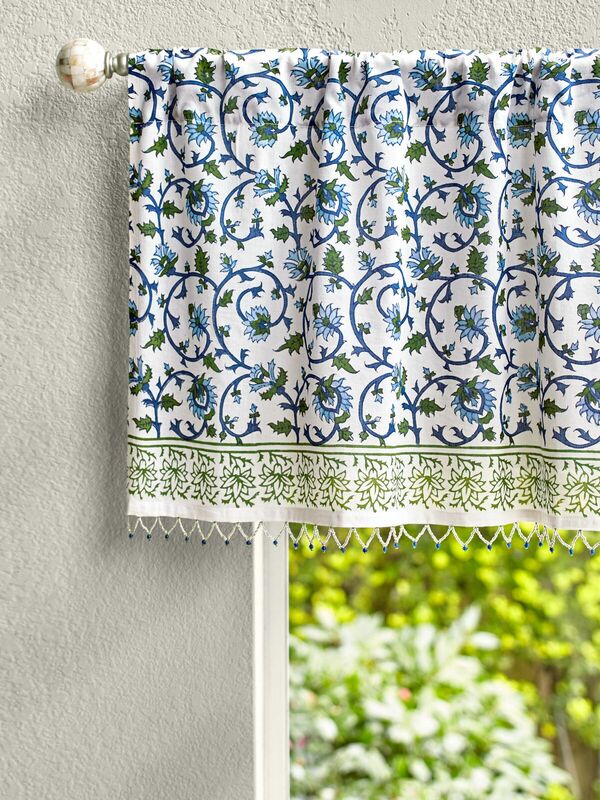 Once you’ve layered the colors and shapes of Casablanca, Midnight Lotus (cp) and Midnight Lotus, your room will hang together with a theme of peaceful and flourishing florals. 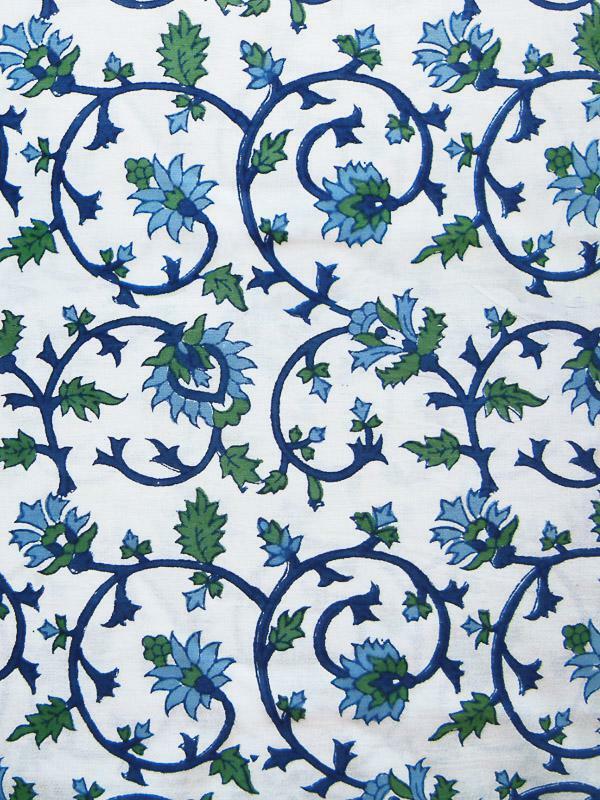 Moonlit Taj is beautiful in the dining room in part because blue and white table linens can compliment seasonal decor year round. In spring or summer, decorate with bright florals and fresh greens; in fall, add the bold contrast of rich foliage; and in winter, use silver and evergreen accessories! 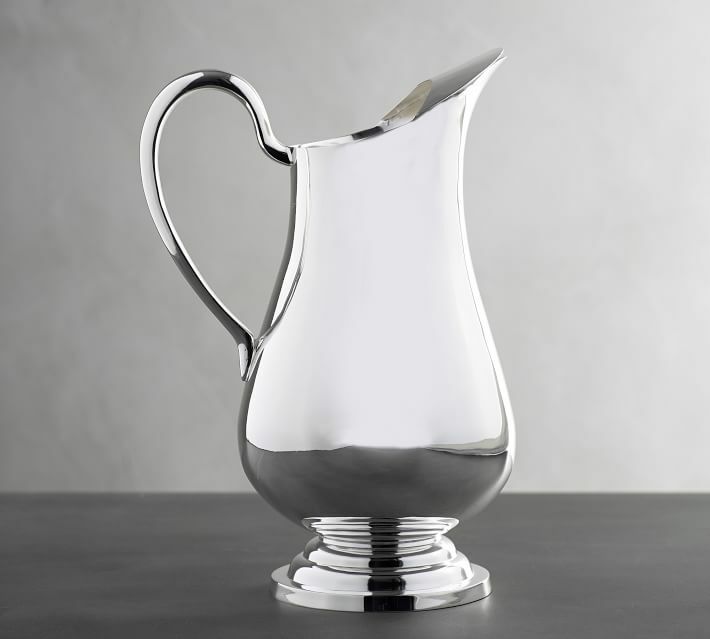 A silver pitcher is an attractive classic, and will be right at home among the elegant blue and white florals of Moonlit Taj. The Bouqs is our go-to florist for year round delivery of small-farm grown, *gorgeous* flowers! 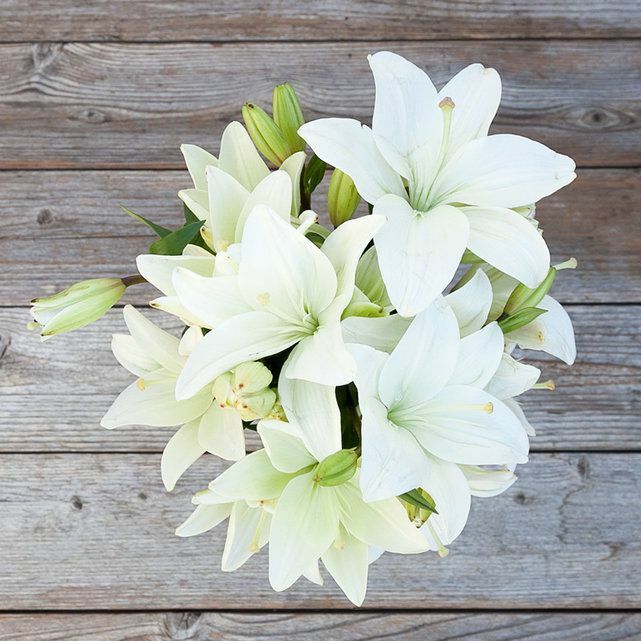 The serene white lilies and pale green foliage make this bunch extra special! 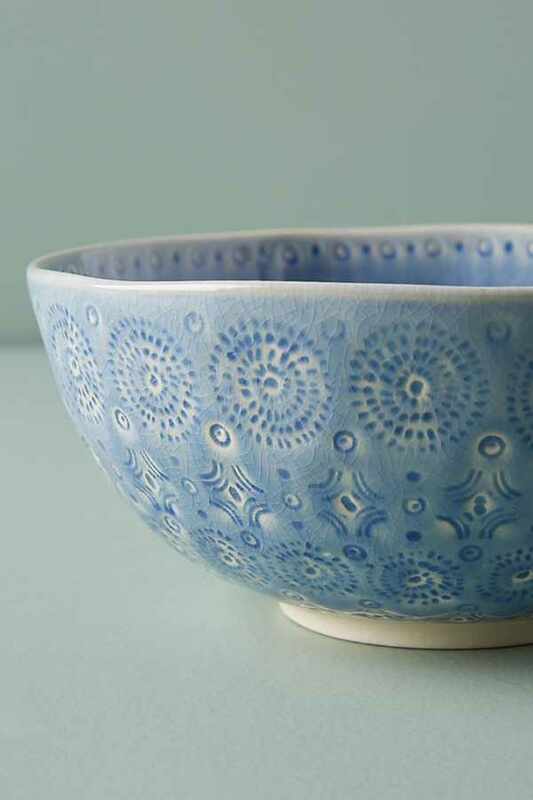 Consider serving fruit or bread in a blue and white embellished bowl like this piece from Anthropologie. Lovely atop Moonlit Taj! A pale blue bedroom is all about peace and quiet, just like we all want our bedrooms to be. Against white or soft green walls, Moonlit Tas is both elegant and easy. 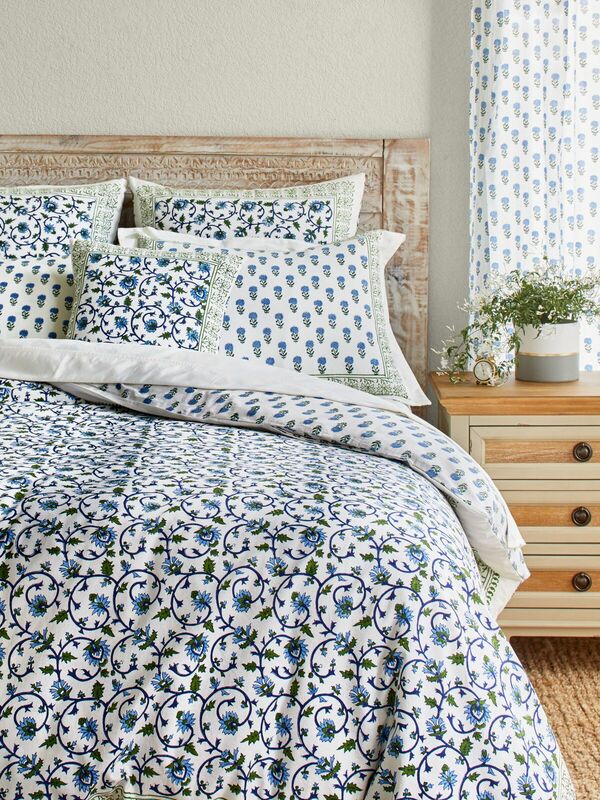 Our reversible duvet allows you to keep the palette the same while playing with scale and pattern. 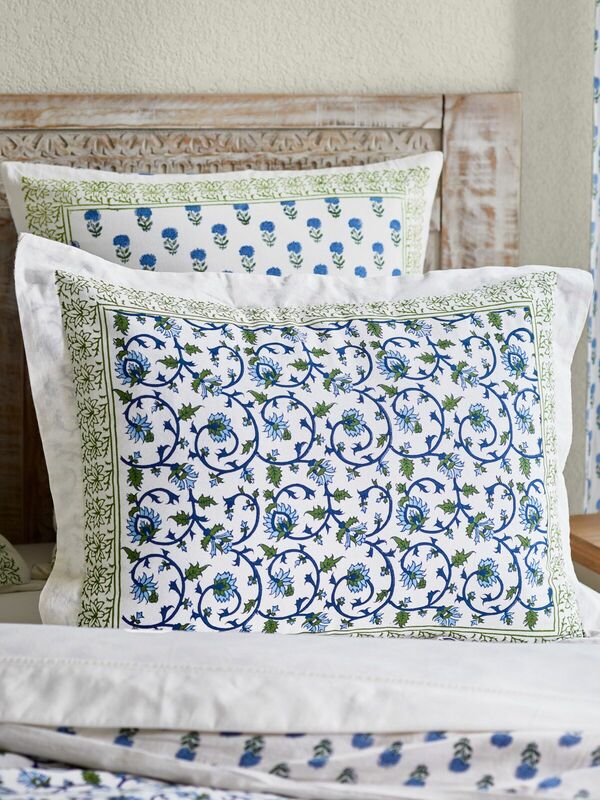 If you like your pillow shams to coordinate perfectly with the bedding, we’ve got you covered. 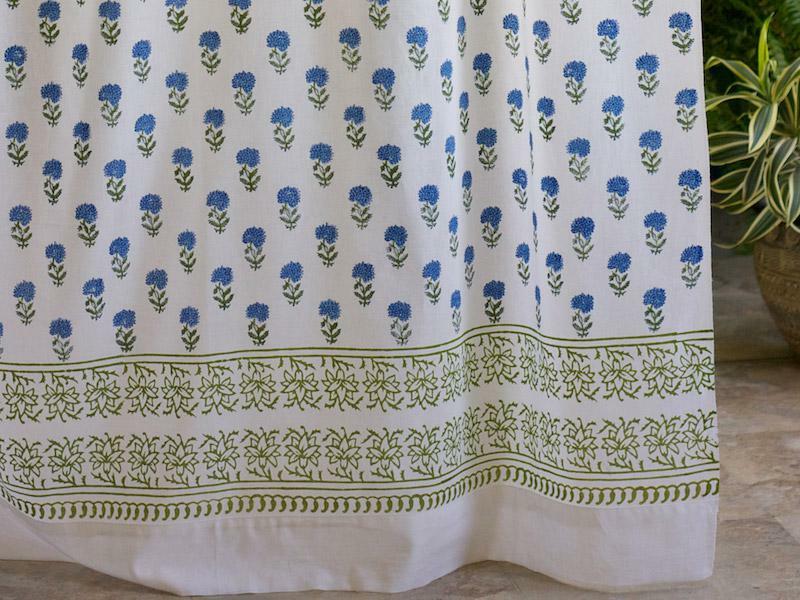 Choose a set of our cheerful matching shams! 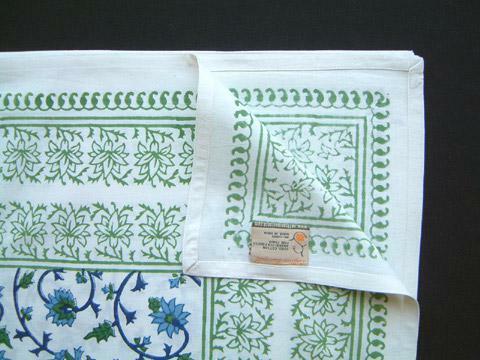 Euro shams can be used behind traditional shams to line the bed and add a burst of contrasting color or value. 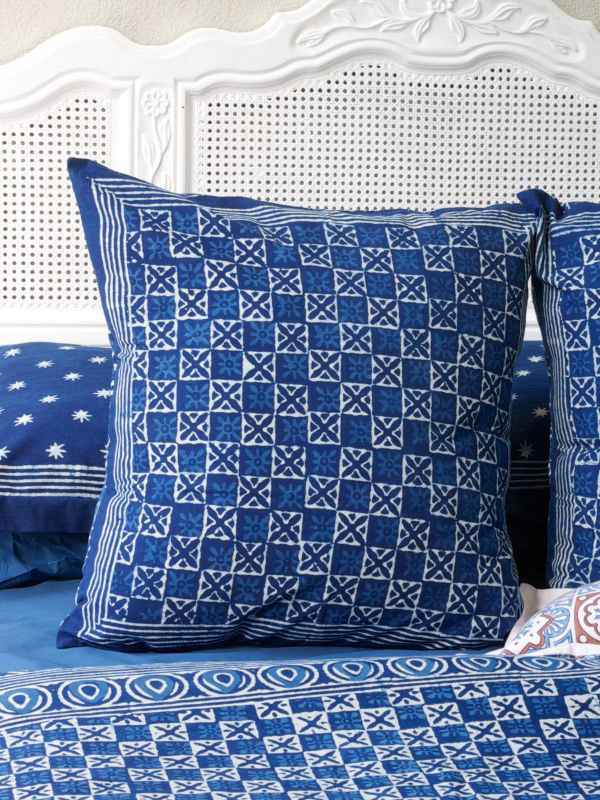 We choose Starry Nights for this role, as their deep indigo will anchor the head of the bed and create a real show-stopper! 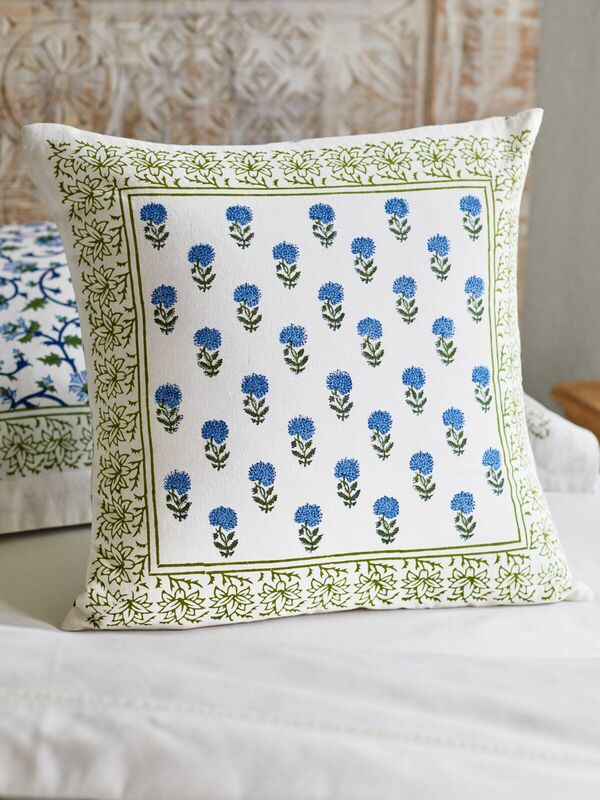 Add a single, smaller throw pillow to the center of the bed in yet another pattern. 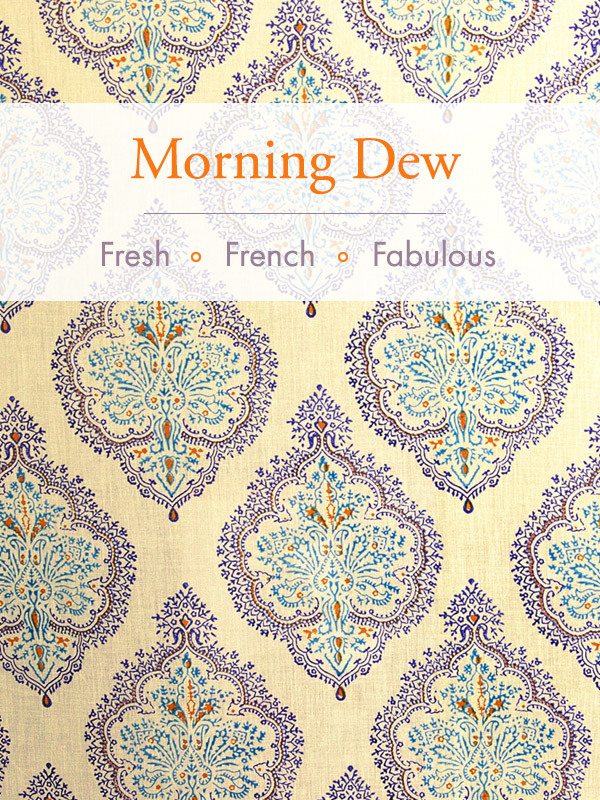 We like the diminutive complimentary print to Moonlit Taj. 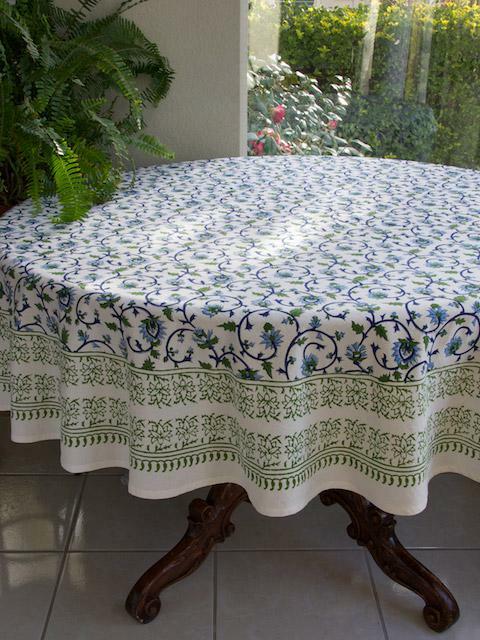 You’ll be using the same colors, but introduced in a delicate, regular pattern. 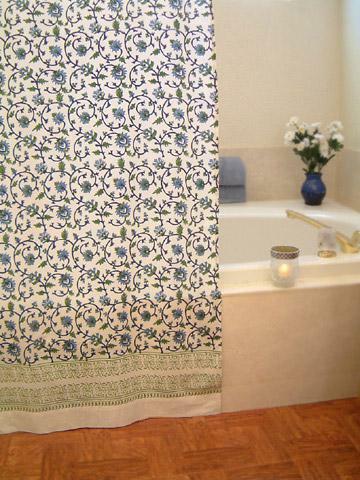 We love to remind our customers that a bath upgrade is as simple as hanging a new shower curtain. 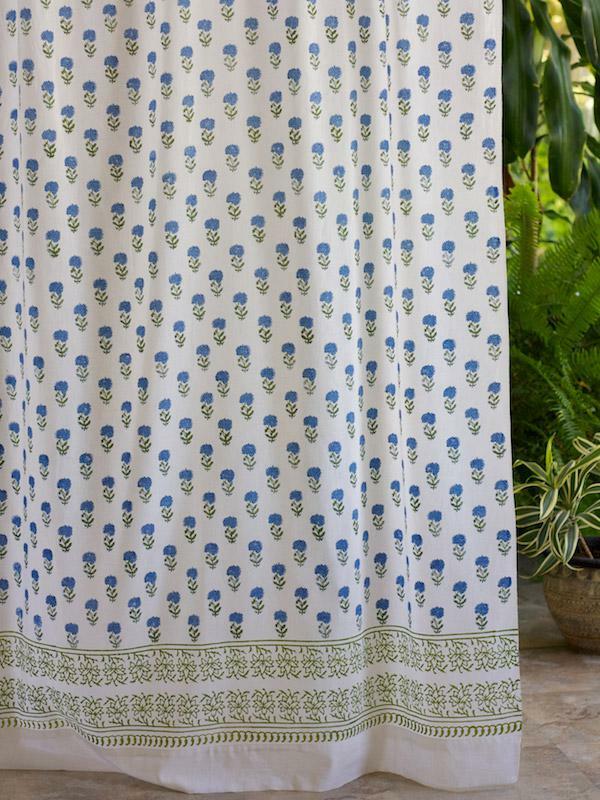 And with our gorgeous, handprinted, washable cotton shower curtain, your new bath will stay uniquely stylish for a long time! 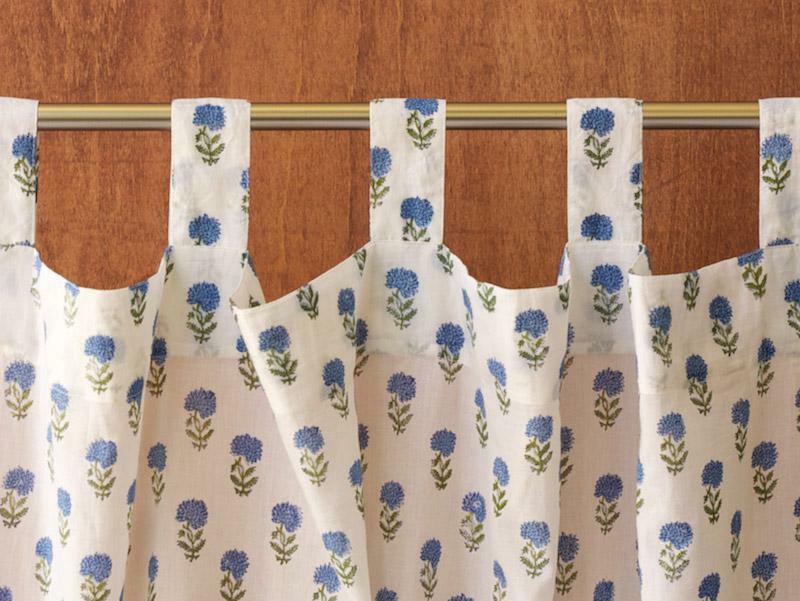 A bathroom can be strictly functional, but a new blue and white shower curtain, along with a modern bath caddy, will make it a place you’ll want to escape to and linger in. 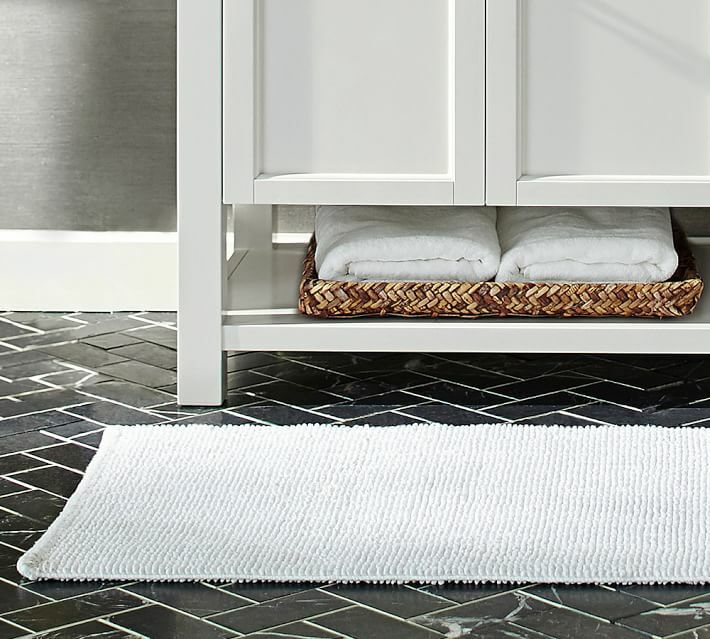 Pottery Barn makes a line of double-wide bath mats, and they are just perfect! If there’s something every bath needs, it’s a bit more softness underfoot. 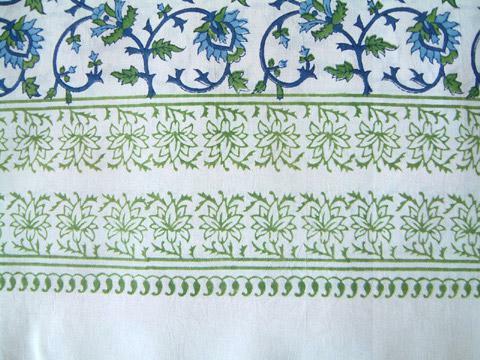 We love this loopy white mat, which will be sweet and subtle next to Moonlit Taj. 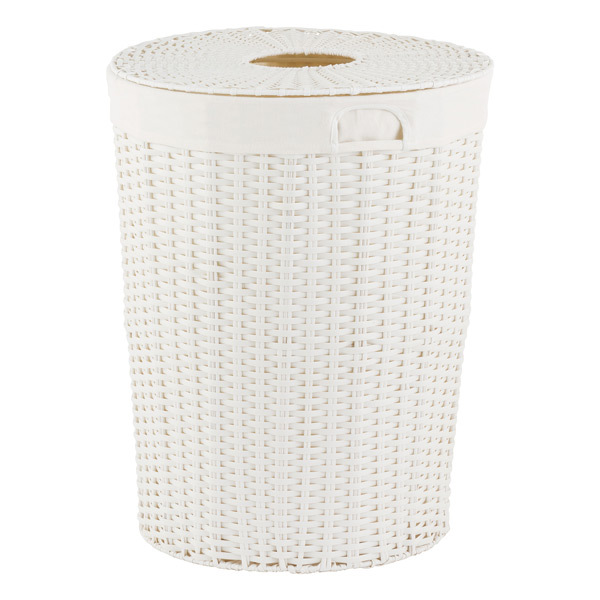 We can’t escape all the functionality of a bath, and so will introduce a woven white hamper. You can toss away towels and shower clothes here, and still keep a neat and tidy space. 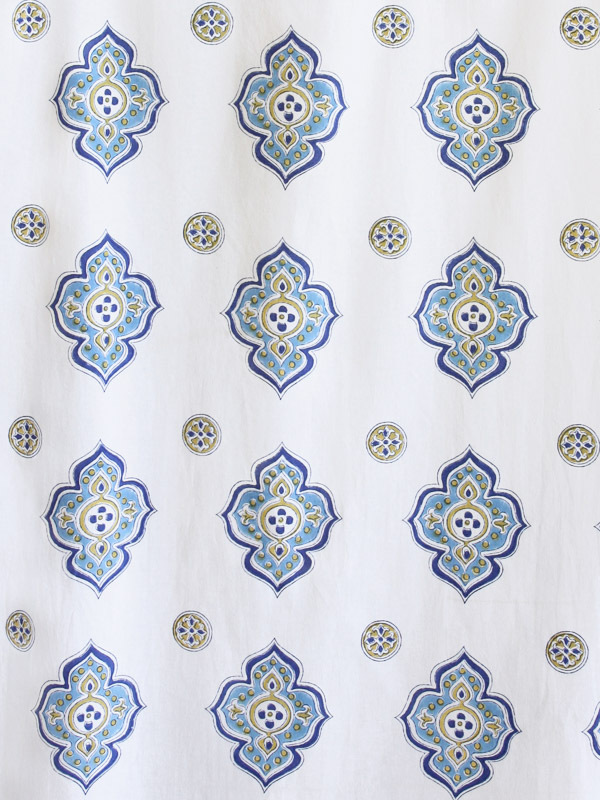 White cotton ground covered in blue and pale sage Moroccan motifs. 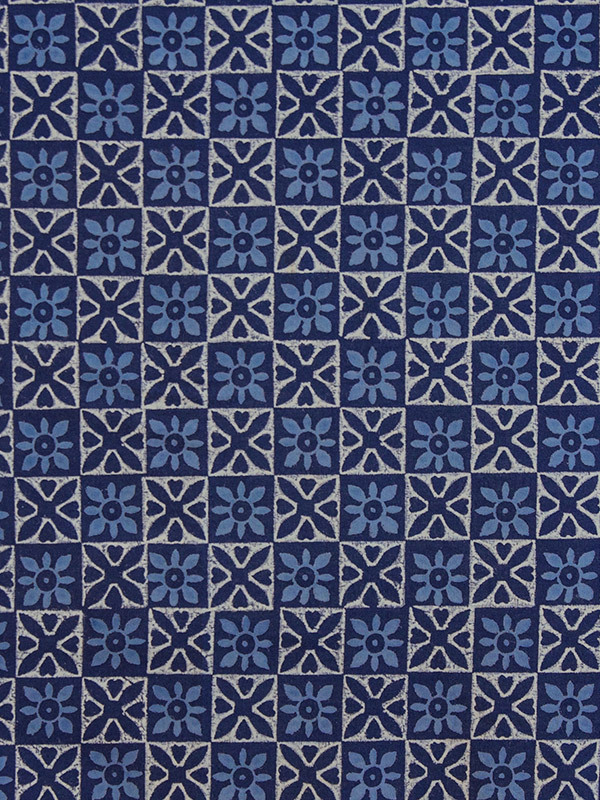 Deep indigo blue printed in a resist style on cotton. 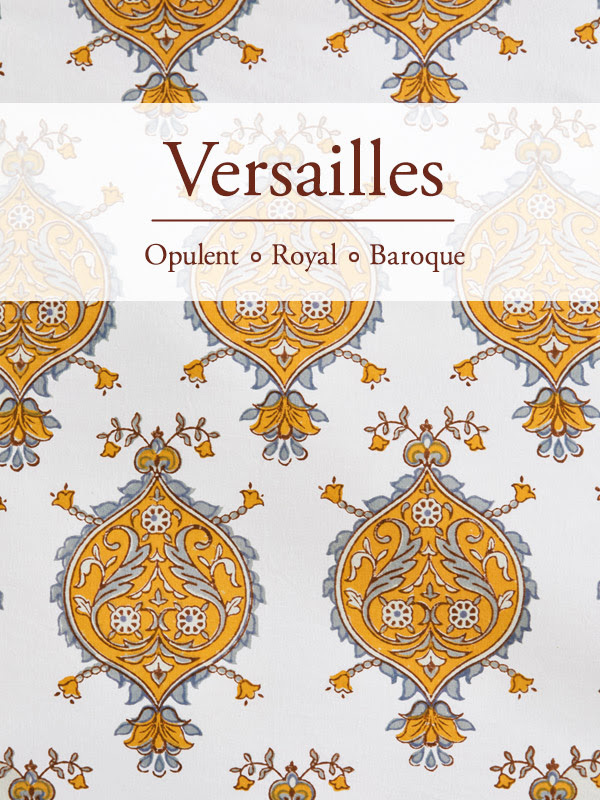 Unique variated lines embedded in the pattern. 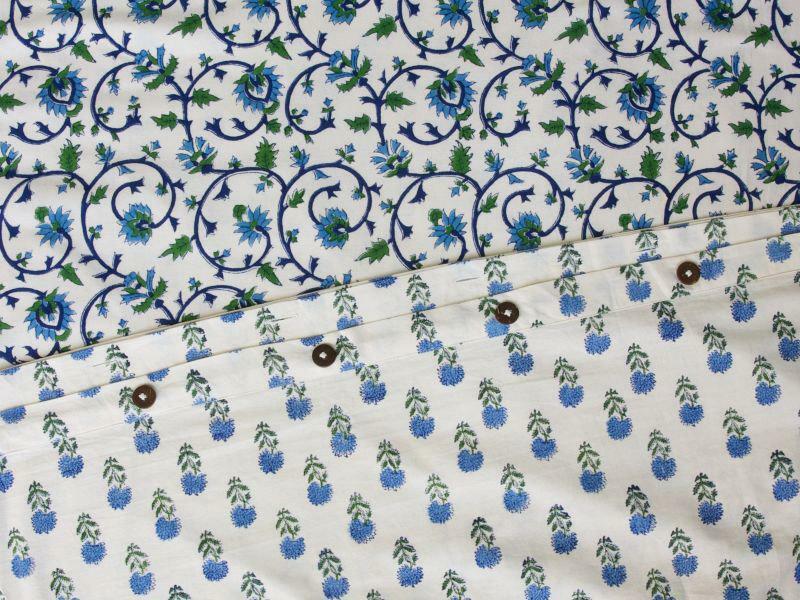 White lotus flowers and scrolling vines printed in blues on white cotton.